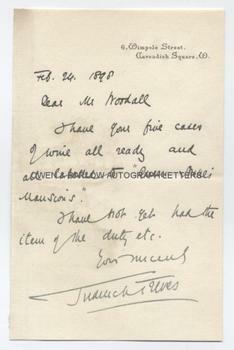 SIR FREDERICK TREVES AUTOGRAPH Letter Signed. British (English) surgeon. Best known today for his friendship with Joseph Merrick, the "Elephant Man". ALS. 1p. 6 Wimpole Street, Cavendish Square, W. February 24th 1896. To [William] Woodall. "I have your five cases of wine all ready and all labelled to 'Queen Anne's Mansions'. I have not yet had the item of the duty, etc." 8vo. Approx 7 x 4.5 inches. Lacking integral blank leaf, slight mounting residue to left edge of blank verso, else fine. From a 19th century collection made by the radical Liberal M.P., William Woodall. Frederick Treves achieved fame when he carried out an operation on the appendix of Edward VII on the eve of his coronation. Appendicitis was not in those days generally operated upon and carried a high mortality rate. Edward had resisted the idea but capitulated when Treves reportedly told him that if he did not have the operation there would be a funeral instead of a coronation. Following the coronation, the name of Frederick Treves was high in the new honours list and surgery on the appendix became a common and acceptable medical practice. Frederick Treves had seen Joseph Merrick (the Elephant Man) when he was exhibited by a showman in a shop opposite to the London Hospital. Treves brought Merrick to the hospital in 1886, where he lived in comparative peace and comfort until his death in 1890.